There is no escaping the size of the 35mm f/1.4 lens – the large f/1.4 aperture and full-frame coverage mean that it uses some large, heavy elements. Weighing 630g and measuring 78 x 112mm, it is one of the largest lenses we have seen for the Sony Alpha 7 cameras, and it is certainly large when compared to its full-frame DSLR equivalents. It’s also significantly bigger than similar lenses for other CSCs (for example, it’s about twice the size and weight of the Fujifilm XF 23mm f/1.4R, which is designed for APS-C sensors). Is the size and weight a problem? It depends. In terms of handling, no it is not. The aperture ring around the lens barrel means you can easily support the lens and change aperture with your left hand, while the right hand balances the camera and fires the shutter. It is one of those cases where you hold the lens, not the camera. Those who travel light may prefer the 35mm f/2.8 lens, but if you are taking out numerous lenses the extra weight of the f/1.4 over the f/2.8 lens will make very little noticeable difference once your kit is in a bag on your back. 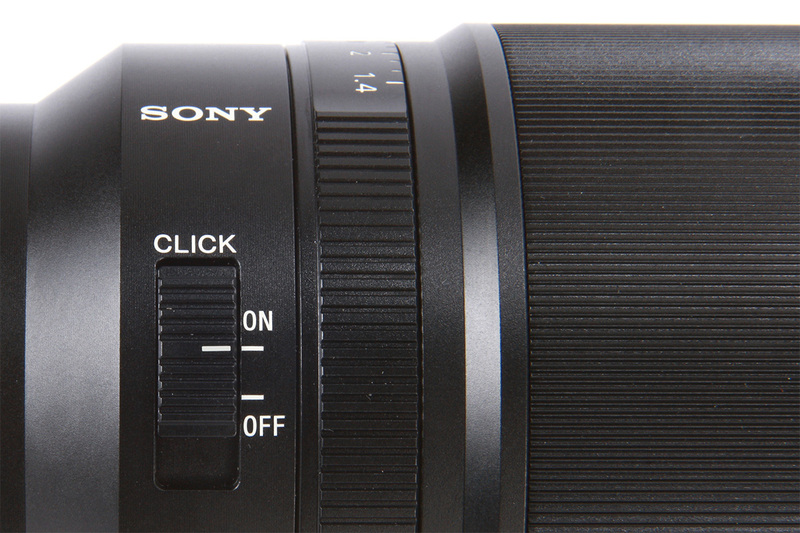 The addition of an aperture ring to the lens adds something to the Sony Alpha 7 system as a whole. It is like the missing piece of the puzzle that gives the Alpha 7 the feel of using a traditional SLR, which is something Sony hasn’t quite managed to capture compared to the likes of Fujifilm with its XT-1. I really hope that Sony and Zeiss produce more lenses for the FE mount with aperture rings. The option to turn the aperture click on or off is very neat, and something that those shooting video will really appreciate. I found the aperture ring to have just enough resistance when turned that it didn’t slip out of position, but it was still easily manoeuvrable. With the live view on the screen, you can watch the depth of field change with the smooth turn of the aperture ring, and again, I’m sure many videographers would like to see this feature included across the FE lens range. As with other lenses in the FE range, the 35mm f/1.4 has electronic fly-by-wire focusing, meaning that turning the focus ring signals for the electronic motors to adjust focus of the lens. The manual-focus ring itself is very wide, and turns smoothly yet precisely. Combined with the 100% manual-focus magnification through the viewfinder, it was fairly fast to get the focus point I wanted. Overall, I am very impressed with how the lens handles, and it has the solid build quality and style one would expect from a lens that bears the Zeiss badge. It is hard to fault the image quality of the 35mm f/1.4 lens. In the centre it is extremely sharp, with only a slight drop-off at the very edges when shooting at f/8. The corners aren’t as sharp when shooting wide open. However, at this maximum f/1.4 aperture the shallow depth of field is lovely, with smooth out-of-focus areas that blend into one another. Vignetting is noticeable at most aperture settings, but at f/1.4 it is very prominent, with very dark corners to images. However, vignetting doesn’t concern me, and I am actually drawn to the vignetting on the f/1.4 aperture because, when combined with shallow depth of field and the level of contrast that the lens offers, images take on a very cinematic quality. If vignetting isn’t your thing, the camera does a good job of correcting JPEG images, or it is easily removed when converting raw files. There is some red/cyan chromatic aberration visible when shooting at f/1.4, but by the time the lens is at f/4 it is significantly reduced, and it has gone by f/8. Again, I found that it is easily cleared up when editing raw images. Our MTF tests are conducted using Applied Imaging charts and software. We’ve tested the Sony Zeiss Distagon T* 35mm f/1.4 ZA on the Sony Alpha 7R, which has a 36MP full frame sensor and no optical low-pass filter. Our tests reveal a lens that is impressively sharp in the centre wide open, however the corners are somewhat soft. Stop down to f/2.8 and the centre sharpness up a little, but the edges stay much the same. Much bigger improvements follow, though, with the very best results from f/5.6 to f/11. At the minimum aperture of f/16, diffraction slightly softens the image. Distortion is very low indeed; our tests show a little barrel-type in the images, but you’ll be hard pushed to spot it in real-world use. As is typical of a fast prime for full-frame cameras, vignetting is rather pronounced, reaching a maximum of almost two stops wide open. The falloff profile is also somewhat abrupt into the corners of the frame, making it very visible in real-world shots. Stopping down to f/2.8 reduces the effect significantly. Yes, it may be expensive, large and a weigh a bit, but it is the closest experience I have had to shooting with a manual DSLR that I have had with the Alpha 7R. It is amazing what something as simple as adding an aperture ring can do. Overall, if you are look for a good general lens, particularly for landscape and travel images, I wholeheartedly recommend the Zeiss Distagon T* FE 35mm f/1.4 ZA lens – if your bank manager and chiropractor will allow it.